A loess smoothed line: That’s the sort of wavy line. It’s a nonparametric smoother of the data. The fact that it doesn’t deviate much from the straight line is an indicator that linear regression is fairly appropriate here. Labels for each point. 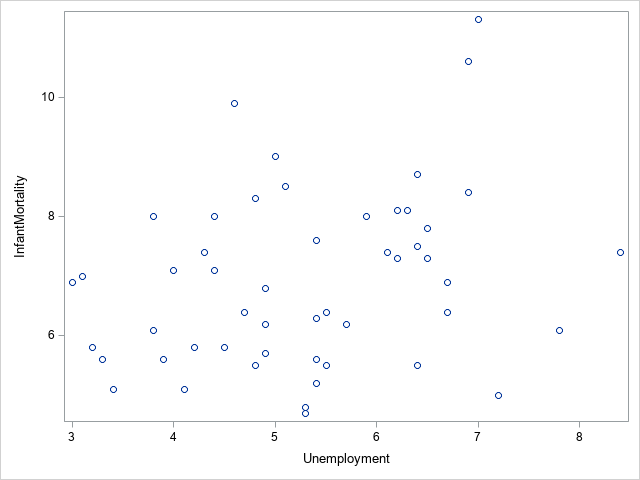 Here, they are states and the variables are unemployment and infant mortality. Kernel density plots for each variable, a good univariate graphic. A confidence ellipse, letting you see that DC and Mississippi are bivriate outliers. which sets up a template for use by the graph template language (the stuff after a * is commentary on what that part of the code does. 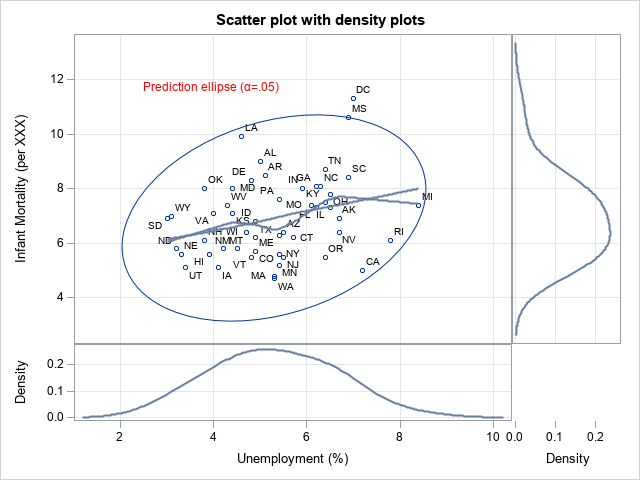 For more, see my paper on scatter plots. Of course, you might want other information in some cases. If either variable was discrete, you might add histograms instead of density plots. You might want to color code the points (e.g. I could have color coded for region of the country. You might want several different loess lines; or, if there were discontinuities, you might want to use wavelets to generate the line.